Oh joy! A second fairytale series. A new beginning full of happy endings. Time to go back to school with all your Ever After buddies. (We’ve never been so happy for the first day of class.) You can’t have a decent fairy tale without a decent villain. That’s why Ever After High runs a General Villainy class. Yep, lessons that teach you to be bad! This term’s new intake contains Lizzie Hearts and Duchess Swan. Apart from her ‘off with their heads’ habit, Lizzie’s no baddie – she’s all heart. But Duchess has no happy ending, and she’s very unhappy about it. Could she ace the class as the school’s next top villain? So brave, courageous and amazing! This book is the best! I wanted to read this as I have read the other series and thought it was good. I have seen the videos sand wanted to know more about the characters and this book gives me that. I can’t wait to read Kiss and Spell! 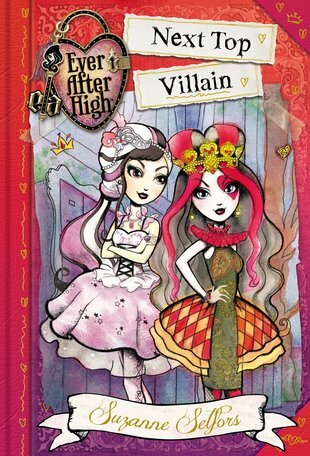 i love ever after high!! !